Bicyclists won a temporary restraining order against plans to remove a cycle track on Potomac Street in Canton that has sparked a heated dispute between Mayor Catherine Pugh and bike advocates. The mayor’s chief of strategic alliances, James T. Smith Jr., had informed residents that the Department of Transportation would be “totally removing” the newly-installed cycle track and reverting to the old configuration in which cars could be parked next to the curb. Demolition of the $775,000 track was to start on Monday, Smith wrote, to be followed by the submission of “multiple” new bike infrastructure concepts for Potomac Street. 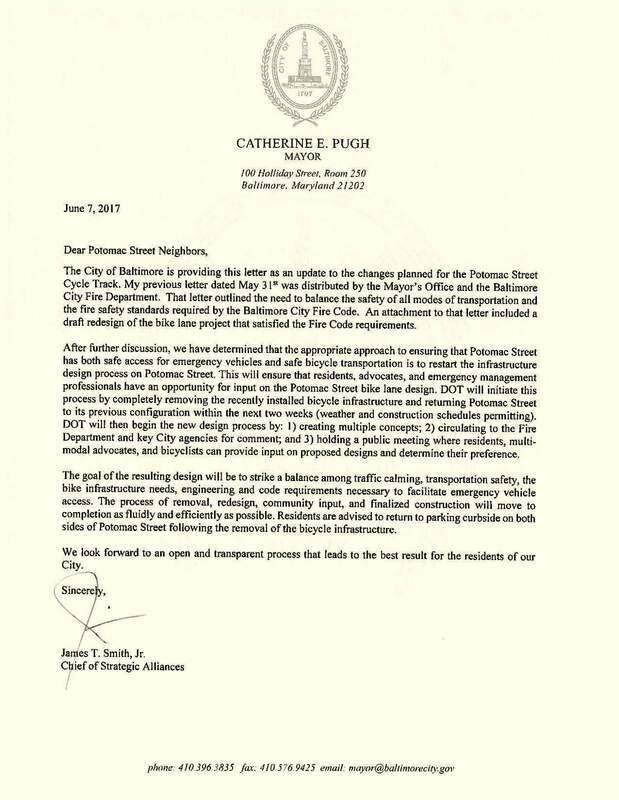 The decision to remove the bike lane came after Mayor Pugh told reporters that Potomac Street “got to be up to code” and not violate a provision of the fire code calling for 20-foot clearances on roadways to allow fire and other emergency vehicles to pass safely. Bikemore, the advocacy group that secured Friday’s restraining order on behalf of two city residents, has described the removal of the cycle track as arbitrary and capricious. The order was granted by Circuit Court Judge Althea M. Handy. The complaint by Marisa Saville and Stephen Iannelli argues that the city has installed miles of reverse-angle parking and approved private developments that fail to meet the “20-foot-clear” standard. Yesterday’s legal action came in the wake of the Roland Park Civic League’s call on the mayor to remove the cycle track on Roland Avenue, a longstanding source of contention in the North Baltimore community. A third cycle track, installed on Maryland Avenue and Cathedral Street between Johns Hopkins University and downtown, has not been directly impacted by the growing dispute. 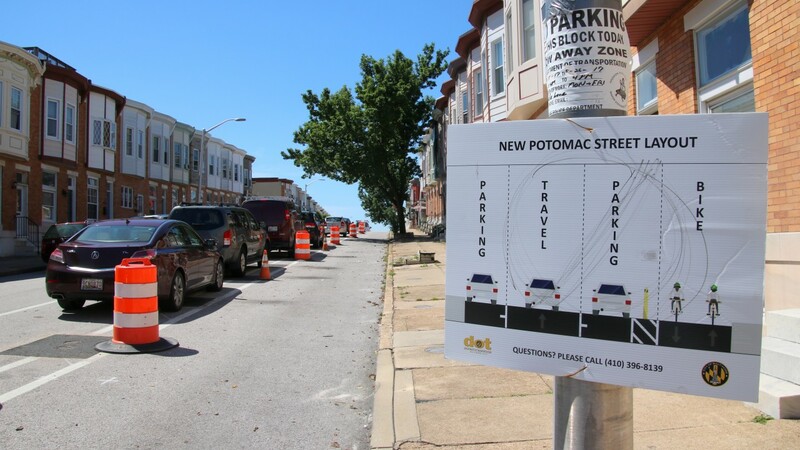 Bikemore, however, has told supporters that the Maryland Avenue track is now under re-evaluation by the Pugh administration and the Downtown Bike Network has been halted. 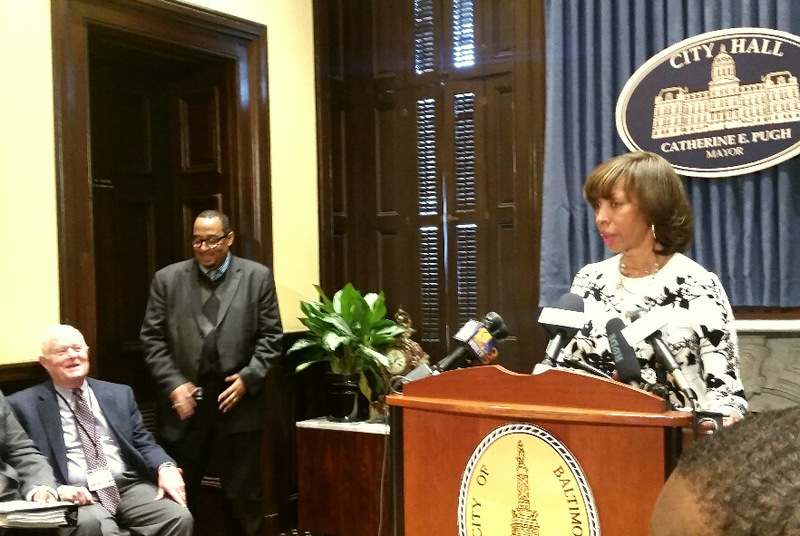 Pugh’s spokesman, Anthony McCarthy, denied those charges, saying the mayor is fully committed to improving bike infrastructure, but must balance bike needs against public safety. Mark Edelson, a lawyer representing the two plaintiffs in yesterday’s hearing, said the city is jeopardizing hundreds of thousands of dollars of state and federal funding by its actions. “This shortsighted decision puts this funding at risk. Our city was already forced to walk away from federal funding for transit and improved mobility. We will not allow that to happen again,” Edelson said, referring to the cancelled Red Line light-rail project. Liz Cornish, Bikemore’s executive director, said the group offered Mayor Pugh “numerous recommendations” for handling the controversy before going to court. “Bikemore had hoped this would have been resolved another way,” she said last night.